Earlier in the week news surfaced about the cancellation of a sequel to the highly regarded N64 title Perfect Dark, as well as its prequel Perfect Dark Zero. While not surprising, the cancellation brings with it some interesting tidbits about the direction of the abandoned game, and suggests that it wasn’t going to embody what it means to be a Perfect Dark title. The first clue to this is the implication that Perfect Dark Core (the sequel’s working title) appeared to be a much darker game than the previous two, its tone more moody in atmosphere and its direction seemingly in pursuit of a realistic experience. You know the sort, a game that isn’t actually realistic but pretends to be in some vain attempt to be ‘mature’. Word has it that Joanna -- no longer the protagonist but relegated to a sidekick or companion -- was to lose some of the elegance and grace that made her so compelling, and instead she’d be more flirtatious and do things like smoke. This alone suggests an ill-conceived direction for the now defunct title but furthermore, it implies that Joanna was being changed to cater for the masses by accentuating her sexuality and giving her some attitude, because obviously that’s supposed to appeal to everybody (read: men). The next issue was the aforementioned shift to a male protagonist, Joanna working by your side rather than by your button presses. Changing protagonists in itself isn’t necessarily a bad thing as it can offer a unique and different perspective to what everybody is used to, but in this instance it sounds like it was being done in an effort to broaden the franchise’s fanbase -- and the sales that go with that -- by putting players in the role of yet another male figure willing to shoot anything that moves, no doubt exhibiting some attitude along the way. In other words, it seems like the change was being made to make the next Perfect Dark game like most shooters already on the market, because clearly it sells and after Perfect Dark Zero’s lackluster performance god knows it needs some sales and attention. This is concerning simply because it appears to be a backwards step, one not only unnecessary but also rather strange after the efforts made to ensure Joanna was a classy, compelling female character. The addition of mechs also seems to prove the point, suggesting the game was going to be even more action-packed than its predecessors already were. Futuristic vehicles aren’t a new concept to the series, by any means, but mechs imply violence a lot quicker than any vehicle that existed in Perfect Dark or its prequel. 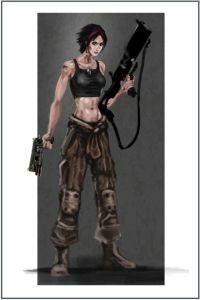 Concept art (such as the one of Joanna in this post) and video footage* also demonstrate a direction that, while interesting, doesn’t correlate with the personality of the Perfect Dark franchise, separating Perfect Dark Core from its predecessors even further. Obviously the game’s cancellation means all of this is now irrelevant, but I felt compelled to write about it anyway because the original Perfect Dark is one of my favourite games and because, as a franchise -- regardless of whether it garnered success or not -- it was smart, if not in design than certainly in concept and ambition. Joanna was a clever character, elegant and capable; the sci-fi story and elements were rich and believable; and in a lot of respects, the game was ahead of its time -- for better and for worse -- ensuring that it was worthy of attention, if not direct praise. Any new direction the franchise could take should be carefully considered and, like the recently revealed reboot of Tomb Raider, approached with respect to the past but with an aim to revitalise the future. Perfect Dark Core, based on what has been revealed about the project, seemed to be aspiring to none of those things and instead, appeared destined to pander to a demographic that the videogames industry seems so intent on catering to, but continually fails to recognise that it doesn’t actually exist. As a fan of the series and of the medium of games as a whole, such a direction is disheartening, which is why as much as it hurts to hear that what is essentially a Perfect Dark 2 has been canned, I’m glad the game was abandoned. I can only hope that in future, any other potential Perfect Dark games are approached with the same grace and intelligence that defines the series and made it so popular to begin with. *It's also intriguing that some of the footage is particularly reminiscent of Mirror's Edge. When I first heard about the sequel that was to be abandoned, I was sad. Then I heard the details. *wipes brow* Phew! Crisis averted! Alli -- Sums up my reaction too. I saw the headline, sighed in disappointment and read the article, happy that someone recognised the lost direction and canned the project. I'm still optimistic that one day there will be another Perfect Dark but if there is one, whoever is making it needs to understand what makes the series what it is. Some respect for Joanna as a character is a must, too.